This outfit is a million times cuter in person, I swear. Anyways, this is a warm, comfy outfit- perfect for a day like today. Some kind of 24 hour bug hit me in full force like a mack truck just as my class was starting. By the time rehearsal was over, I was exhausted and hot and shaky. I somehow managed the 45 minute drive home and stumbled into bed. Luckily, I went to bed and woke up feeling better. Still not 100%, but better. At least I had a cute and comfy outfit to wear! 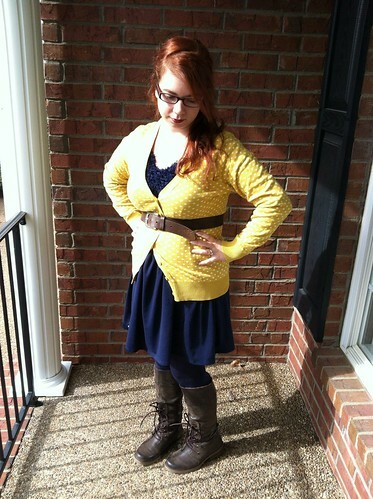 I love pairing navy and yellow together, and the boots are so much fun. « Tuesday’s Ten: Halloween Candy Edition!